I'm on my third reading of a dense open access paper by Thomas Metzinger in Frontiers in Psychology titled "The myth of cognitive agency: subpersonal thinking as a cyclically recurring loss of mental autonomy." Readers interested in my Upstairs/Downstairs web lecture or the March 19 post on Metzinger might want to check it out. My headache sets in from trying to remember and keep in mind the numerous abbreviations he uses for economy in the text - AA, CA, PSM,EAM, SRB, UI, etc. - a whole glossary for them is provided. Of particular interest are his two suggested criteria, noted in the abstract just below, for "individuating single episodes of mind-wandering, namely, the “self-representational blink” (SRB) and a sudden shift in the phenomenological “unit of identification” (UI)." I pass on the abstract first, and then a few clips from the sections of the paper titled "Mind wandering as a switch in the unit of identification" and "The re-appearance of meta-awareness"
This metatheoretical paper investigates mind wandering from the perspective of philosophy of mind. It has two central claims. The first is that, on a conceptual level, mind wandering can be fruitfully described as a specific form of mental autonomy loss. The second is that, given empirical constraints, most of what we call “conscious thought” is better analyzed as a subpersonal process that more often than not lacks crucial properties traditionally taken to be the hallmark of personal-level cognition - such as mental agency, explicit, consciously experienced goal-directedness, or availability for veto control. I claim that for roughly two thirds of our conscious life-time we do not possess mental autonomy (M-autonomy) in this sense. Empirical data from research on mind wandering and nocturnal dreaming clearly show that phenomenally represented cognitive processing is mostly an automatic, non-agentive process and that personal-level cognition is an exception rather than the rule. This raises an interesting new version of the mind-body problem: How is subpersonal cognition causally related to personal-level thought? More fine-grained phenomenological descriptions for what we called “conscious thought” in the past are needed, as well as a functional decomposition of umbrella terms like “mind wandering” into different target phenomena and a better understanding of the frequent dynamic transitions between spontaneous, task-unrelated thought and meta-awareness. In an attempt to lay some very first conceptual foundations for the now burgeoning field of research on mind wandering, the third section proposes two new criteria for individuating single episodes of mind-wandering, namely, the “self-representational blink” (SRB) and a sudden shift in the phenomenological “unit of identification” (UI). I close by specifying a list of potentially innovative research goals that could serve to establish a stronger connection between mind wandering research and philosophy of mind. Because mindfulness and mind wandering are opposing constructs, the process of losing and regaining meta-awareness can be most closely studied in different stages of classical mindfulness meditation. In the early stages of object-oriented meditation, there will typically be cyclically recurring losses of mental autonomy, plus an equally recurring mental action, namely the decision to gently, but firmly bring the focus of attention back to the formal object of meditation, for example to interoceptive sensations associated with the respiratory process. Here, the phenomenology will often be one of mental agency, goal directedness, and a mild sense of effort. In advanced stages of open monitoring meditation, however, the aperture of attention has gradually widened, typically resulting in an effortless and choiceless awareness of the present moment as a whole. Such forms of stable meta-awareness may now be described as shifts to as state without a UI. Whereas in beginning stages of object-oriented mindfulness practice, the meditator identifies with an internal model of a mental agent directed at a certain goal-state (“the meditative self”), meta-awareness of the second kind is typically described as having an effortless and non-agentive quality. Interestingly, the neural correlates pertaining to this difference between “trying to meditate” and meditation are now beginning to emerge (Garrison et al., 2013, graphic from this paper is in my Upstairs/Downstairs web lecture). Although self-rated personality traits predict mortality risk, no study has examined whether one’s friends can perceive personality characteristics that predict one’s mortality risk. Moreover, it is unclear whether observers’ reports (compared with self-reports) provide better or unique information concerning the personal characteristics that result in longer and healthier lives. To test whether friends’ reports of personality predict mortality risk, we used data from a 75-year longitudinal study (the Kelly/Connolly Longitudinal Study on Personality and Aging). In that study, 600 participants were observed beginning in 1935 through 1938, when they were in their mid-20s, and continuing through 2013. Male participants seen by their friends as more conscientious and open lived longer, whereas friend-rated emotional stability and agreeableness were protective for women. Friends’ ratings were better predictors of longevity than were self-reports of personality, in part because friends’ ratings could be aggregated to provide a more reliable assessment. Our findings demonstrate the utility of observers’ reports in the study of health and provide insights concerning the pathways by which personality traits influence health. Between 1935 and 1938, 600 individuals (300 engaged heterosexual couples) began participating in the KCLS, a longitudinal study on personality and newly formed marriages. Participants were recruited through newspaper advertisements, other advertisements, and word of mouth in the state of Connecticut. The participants were primarily from middle-class backgrounds...Peer ratings were obtained from people that participants identified as knowing them well enough to provide accurate ratings; most of these friends had been in the participants’ wedding parties. Each participant named three to eight friends, and the majority of participants were rated by five friends...Self-ratings and peer ratings of personality were obtained using the 36-item Kelly Personality Rating Scale..we conducted a study to validate the PRS using more modern personality measures: the Big Five Inventory, the Iowa Personality Questionnaire, and the Mini International Personality Item Pool...The resulting five-factor solution reflected the Big Five factor structure. Extraversion was assessed with five items (e.g., quiet, popular), agreeableness with six items (e.g., courteous, sincere), conscientiousness with five items (e.g., persistent, reliable), emotional stability with four items (e.g., nervous, temperamental), and openness with four items (e.g., cultured, intelligent). Analyses indicated that the model adequately captured variation in modern Big Five composite scores...The average life span for men was 75.2 years (range = 23–98 years, SD = 15.5). The average life span for women was 81.3 years (range = 23–102 years, SD = 13.4). The 21 surviving participants had an average age of 97.2 years (SD = 2.1) in 2013. Resting respiratory sinus arrhythmia (RSAREST) indexes important aspects of individual differences in emotionality. In the present investigation, we address whether RSAREST is associated with tonic positive or negative emotionality, and whether RSAREST relates to phasic emotional responding to discrete positive emotion-eliciting stimuli. Across an 8-month, multiassessment study of first-year university students (n = 80), individual differences in RSAREST were associated with positive but not negative tonic emotionality, assessed at the level of personality traits, long-term moods, the disposition toward optimism, and baseline reports of current emotional states. RSAREST was not related to increased positive emotion, or stimulusspecific emotion, in response to compassion-, awe-, or pride-inducing stimuli. These findings suggest that resting RSA indexes aspects of a person’s tonic positive emotionality. Compassion is an affective response to another’s suffering and a catalyst of prosocial behavior. In the present studies, we explore the peripheral physiological changes associated with the experience of compassion. Guided by long-standing theoretical claims, we propose that compassion is associated with activation in the parasympathetic autonomic nervous system through the vagus nerve. Across 4 studies, participants witnessed others suffer while we recorded physiological measures, including heart rate, respiration, skin conductance, and a measure of vagal activity called respiratory sinus arrhythmia (RSA). Participants exhibited greater RSA during the compassion induction compared with a neutral control (Study 1), another positive emotion (Study 2), and a prosocial emotion lacking appraisals of another person’s suffering (Study 3). Greater RSA during the experience of compassion compared with the neutral or control emotion was often accompanied by lower heart rate and respiration but no difference in skin conductance. In Study 4, increases in RSA during compassion positively predicted an established composite of compassion-related words, continuous self-reports of compassion, and nonverbal displays of compassion. Compassion, a core affective component of empathy and prosociality, is associated with heightened parasympathetic activity. If you simply google "vagus nerve" you will find sites listing means of enhancing vagus activity and tone by self stimulation to improve mood and functioning, as an antidote to anxiety, etc. Manipulating moral decisions by exploiting eye gaze. We hypothesized that participants’ eye gaze reveals their decision process owing to general coupling between sensorimotor decision processes. 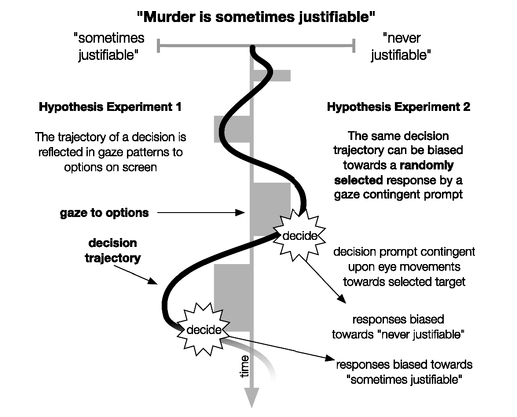 By using a gaze-contingent probe and selecting when a decision is prompted the resulting choice can be biased toward a randomly predetermined option. Sáez et al. enhance human egalitarian behavior in humans with tolcapone - a drug approved for use with Parkinson's disease patients - which prolongs the effect of brain dopamine by inhibiting the enzyme that breaks it down. Egalitarian motives form a powerful force in promoting prosocial behavior and enabling large-scale cooperation in the human species. At the neural level, there is substantial, albeit correlational, evidence suggesting a link between dopamine and such behavior. However, important questions remain about the specific role of dopamine in setting or modulating behavioral sensitivity to prosocial concerns. Here, using a combination of pharmacological tools and economic games, we provide critical evidence for a causal involvement of dopamine in human egalitarian tendencies. Specifically, using the brain penetrant catechol-O-methyl transferase (COMT) inhibitor tolcapone, we investigated the causal relationship between dopaminergic mechanisms and two prosocial concerns at the core of a number of widely used economic games: (1) the extent to which individuals directly value the material payoffs of others, i.e., generosity, and (2) the extent to which they are averse to differences between their own payoffs and those of others, i.e., inequity. We found that dopaminergic augmentation via COMT inhibition increased egalitarian tendencies in participants who played an extended version of the dictator game. Strikingly, computational modeling of choice behavior revealed that tolcapone exerted selective effects on inequity aversion, and not on other computational components such as the extent to which individuals directly value the material payoffs of others. Together, these data shed light on the causal relationship between neurochemical systems and human prosocial behavior and have potential implications for our understanding of the complex array of social impairments accompanying neuropsychiatric disorders involving dopaminergic dysregulation. As I sit here typing this morning, I'm munching on cocoa nibs, inspired by Friedman's review pointing to the work of Dincheva et al. on a gene whose enzyme product (fatty acid amide hydrolase, FAAH) deactivates and thus regulates the action of our endogenous cannabinoid anandamide (which cocoa nibs contain in small amounts). Cross-species studies enable rapid translational discovery and produce the broadest impact when both mechanism and phenotype are consistent across organisms. We developed a knock-in mouse that biologically recapitulates a common human mutation in the gene for ​fatty acid amide hydrolase (​FAAH) (C385A; rs324420), the primary catabolic enzyme for the endocannabinoid ​anandamide. 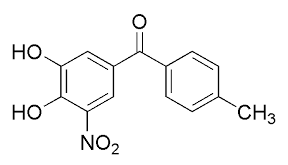 This common polymorphism impacts the expression and activity of ​FAAH, thereby increasing ​anandamide levels. Here, we show that the genetic knock-in mouse and human variant allele carriers exhibit parallel alterations in biochemisty, neurocircuitry and behaviour. Specifically, there is reduced ​FAAH expression associated with the variant allele that selectively enhances fronto-amygdala connectivity and fear extinction learning, and decreases anxiety-like behaviours. These results suggest a gain of function in fear regulation and may indicate for whom and for what anxiety symptoms ​FAAH inhibitors or exposure-based therapies will be most efficacious, bridging an important translational gap between the mouse and human. Neurobiological theories of awareness propose divergent accounts of the spatial extent of brain changes that support conscious perception. 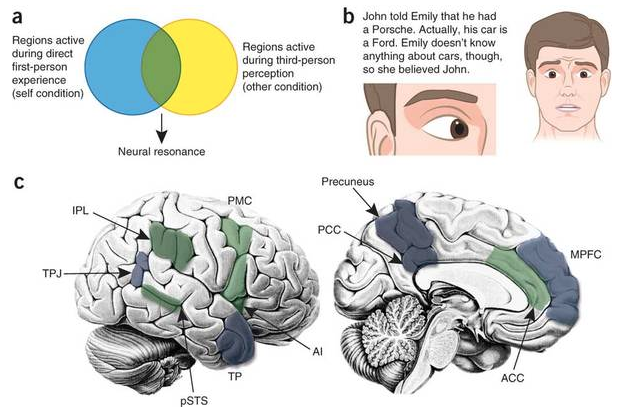 Whereas focal theories posit mostly local regional changes, global theories propose that awareness emerges from the propagation of neural signals across a broad extent of sensory and association cortex. Here we tested the scalar extent of brain changes associated with awareness using graph theoretical analysis applied to functional connectivity data acquired at ultra-high field while subjects performed a simple masked target detection task. 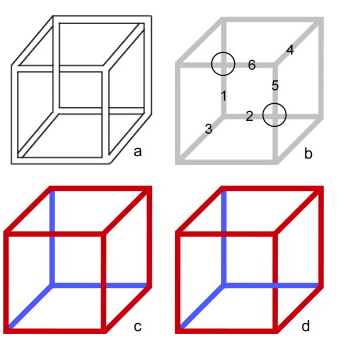 We found that awareness of a visual target is associated with a degradation of the modularity of the brain’s functional networks brought about by an increase in intermodular functional connectivity. 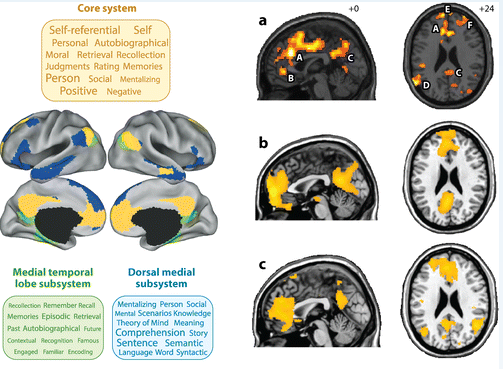 These results provide compelling evidence that awareness is associated with truly global changes in the brain’s functional connectivity. Hartshorne and Germine do a massive analysis of changes in cognitive abilities across the life span, showing that digit symbol coding, digit span, vocabulary, working memory, and facial emotion perception peak and decline at different times, with the last of these continuing to improve into later ages. For each task, the median (interior line), interquartile range (left and right edges of boxes), and 95% confidence interval (whiskers) are shown. WM = working memory. Understanding how and when cognitive change occurs over the life span is a prerequisite for understanding normal and abnormal development and aging. Most studies of cognitive change are constrained, however, in their ability to detect subtle, but theoretically informative life-span changes, as they rely on either comparing broad age groups or sparse sampling across the age range. Here, we present convergent evidence from 48,537 online participants and a comprehensive analysis of normative data from standardized IQ and memory tests. Our results reveal considerable heterogeneity in when cognitive abilities peak: Some abilities peak and begin to decline around high school graduation; some abilities plateau in early adulthood, beginning to decline in subjects’ 30s; and still others do not peak until subjects reach their 40s or later. These findings motivate a nuanced theory of maturation and age-related decline, in which multiple, dissociable factors differentially affect different domains of cognition.